The MyRide system is gaining massive ground in the USA and its now coming to Australia. MyRide models consist of a seated platform that is fully suspended from the mower giving you 3.0" of travel and the ultimate ride. Watch the video if you below! The much anticipated Toro Titan HD has now landed in store. Toro has given the Titan range an overhaul increasing durability and strength for only a marginal increase in cost. And its also available in three deck sizes! It's design allows for a premium cut delivering professional results and saving you time when mowing your property. Built to handle tough conditions and be used frequently the Toro Titan HD will not disappoint. Powered by the reliable Toro 24.5hp engine and fitted with a big canister air filter system. This ensures the machine has more than enough grunt and its designed to do the miles. 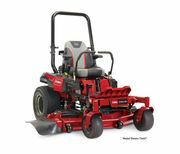 This 60" Titan is equipped with Toro's Turbo Force cutting deck with large commercial grade single housing to deliver day in day out. This is a massive deck and suited for large areas as it will help you get the job done more quickly and efficiently. 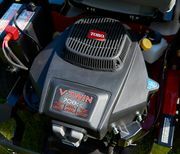 The 4 hour/ 1000 hour limited warranty also proves to you that Toro are producing a product that they believe in. Come into Henderson Mowers & Chainsaws today to check them out.